Welcome to The Ultimate Wedding DJ - great value discos for all wedding receptions in Middlesbrough, Darlington and Teesside, Cleveland, County Durham, Newcastle and North East. We Only Provide An Elegant Disco, Designed To Your Requirements. Pick And Choose All The Songs To Be Played At Your Wedding And You Can Let Us Know Any You Don’t Want Us To Play. Watch Your Wedding Venue With Our LED Room Lighting To Match Your Colour Theme. Your Guests Can Login & Choose A Song Or Two! So You Know Exactly What You Will Get On Your Big Day. We have many years experience working as DJ’s. We’re the preferred choice of many of the premier wedding reception venues across the North East area, including Middleton Lodge, Rudby Hall, Acklam Hall, Ellingham Hall, Wynyard Hall, Cleveland Tontine and Crathorne Hall. We serve the North East area, covering Middlesbrough, Teesside, Sunderland, Hartlepool, Newcastle, Northumberland, Durham, Wynyard, Darlington, Harrogate, Ripon and Thirsk. 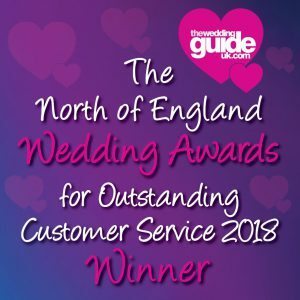 We’re happy to travel to wedding venues outside of the North East area and so can provide wedding disco and DJ services as far as Cleveland, County Durham, Tyne & Wear and North Yorkshire.